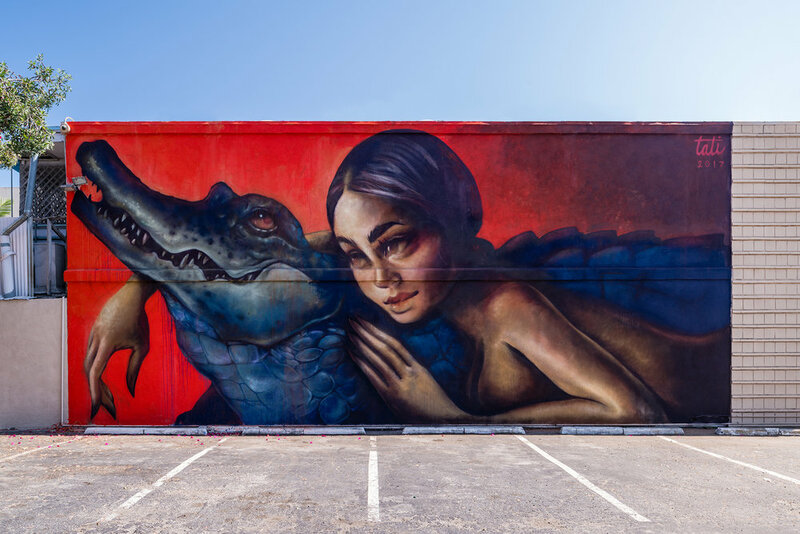 Born and raised in Miami, Tatiana Suarez’s work draws you into a surreal, creamy, and ethereal world filled with doe-eyed figures ornamented by unsettling accompaniments and sexual undertones. On both canvas and walls, Suarez’s work is rich with symbols from her Brazilian and El Salvadorian heritage, juxtaposing the beautiful with the exotic and creepy to create enchanted narratives. The natural mythology and folklore from her respective parent cultures influence her work, from the indigenous face paint and adornment used to the rich and tropical color palettes of the South American landscape.